Crude oil hit $67 a barrel on Monday. Many climate-change watchdogs expected OPEC, the Organization of Petroleum Exporting Countries, who met last week to announce that they would decrease their oil output. Instead, they decided to continue their production levels. OPEC’s 12 member countries, whose production target is 30 million barrels a day, greatly influences international oil prices as they supply 40 percent of the world’s oil and 60 percent of the total petroleum traded internationally. The announcement on Thursday that they would not cut production levels sent shares dropping for Canadian tar sands stocks. This behavior would make you wonder if anyone in the oil industry is listening to the voices battling for climate justice at the COP 20 climate change conference currently taking place in Lima, Peru. The increase in cheap oil on the market will mean an increase in consumption and an increase in climate change, not a decrease. According to the UN Intergovernmental Panel on Climate Change, the majority of fossil fuels must remain in the ground if we are to avoid climate change catastrophe. With us to discuss oil and gas interests in the U.S. and how the North American fossil fuel industry is responding to the OPEC announcement and the subsequent drop in the price of oil and gas is Steve Horn. Steve is joining us from Madison, Wisconsin, and he is a research fellow for DeSmogBlog and a freelance investigative journalist whose work is featured in The Guardian, The Nation, and Truthout. Thank you so much for joining us, Steve. STEVE HORN, RESEARCH FELLOW, DESMOGBLOG: Thanks for having me. I appreciate it. PERIES: So, Steve, what’s your take on OPEC’s announcement that they will not slow down production and the subsequent drop in the price of oil? What effect is it going to have in the natural gas extraction industry? HORN: Well, I think the key takeaway from what’s happening with OPEC and the fact that it’s continuing to step on the gas pedal for oil production is that it can do that. And I think that’s one of the things that hasn’t really been polled about in many analyses put out there yet is that unlike in the United States, where production levels in many of the shale gas and oil basins is actually dropping in a major way, especially in Louisiana and Mississippi and in some–the earliest one in the Barnett Shale in Texas, where it costs so much money to continue drilling, and in which the sweet spots have already been tapped into, and they’re looking just to keep production levels flat, Saudi Arabia and OPEC countries are not reliant on shale gas or shale oil, in which fracking is necessary to obtain that oil. 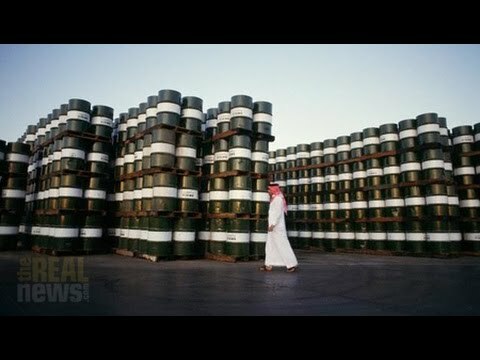 So Saudi Arabia can put its foot on the gas pedal–excuse the pun–and just basically say, we’re going to flood the global market with oil and gas. What that means for the United States is that basically shale gas relies on these super-high, and oil relies on these super-high prices. It was basically reliant on $100 per barrel oil and gas. So we’re going to see in the coming weeks and months–and it’s already being talked about all over the business press is that some of the fields that were booming are going to go to rest for a while. And one of the best examples is the Tuscaloosa Marine Shale. Governor Phil Bryant, the Republican governor of the state, actually–I went to a conference, the Interstate Oil and Gas Compact Commission Conference, and he got up in front of the crowd. And he basically said he’s frightened if the price goes below $80, because that basically shut things down, maybe not 100 percent, but in a major way it would put a damper on the Tuscaloosa Marine Shale in Mississippi. So a lot of these smaller fields where the oil majors aren’t present are going to be feeling the hurt in a major way in the coming months. And that just goes to show, first of all, the shale gas [firm (?)] relies on these high oil prices. But it’s also relied on, since day one, from low interest rates from the Federal Reserve, and it’s relied on a heavy dose of junk debt coming from the Federal Reserve, so high-risk debt that gets–that’s get highly rewarded when there’s higher oil production. But if there’s not all these ingredients, lots of–a big part of at least the shale oil and gas boom has to at least temporarily go to rest. And that just goes to–I think that coming full circle, lots of pundits were out on the trail in the past few years talking about how the United States is becoming a new Saudi Arabia, a Saudi America of sorts. But I think this latest example with OPEC goes to show that I think that there’s one Saudi Arabia, and it’s not in the United States. PERIES: Steve, will we see a slowdown of gas and oil extraction, including fracking and tar sands in Canada? HORN: Well, so Canada is a similar story. It’s not as–it’s not going to be hurt as badly as fracking in the United States, or even fracking in Canada, which is its own sort of animal. But the tar sands, again, a lot of the smaller shale basins start to become uneconomical at about $80 per barrel of oil. The tar sands, most economists say, at about $65 a barrel, it becomes pretty a lot of the projects become uneconomical. So if we keep seeing prices go down, dipping below $60 a barrel, dipping below $50 a barrel, we’re going to see slowed production of the tar sands, especially in areas in which the capital has not already been invested in the fields. PERIES: Right. What is really going on here? Is the oil industry, who was so overrepresented at the climate summit that Ban Ki-moon pulled together at the UN this fall, are they not talking to the Intergovernmental Panel on Climate Change? And do they not have a sense of urgency about what is happening to our climate that they’re living in? HORN: Well, the oil industry has a history of actually funding climate change denial. If you look at a company like Exxon Mobil, you actually haven’t heard their voice a whole lot in the past few days as the price of oil has plummeted, which–I’d be interested to see what Exxon Mobil has to say about this as one of the global oil majors. But that said, I don’t think that the oil and gas corporations really have much to say about climate change. I mean, I think the executives most likely know that they’re causing it, even if they’ve had a history of funding denial. But like you said in the introduction, climate change was basically off the table in these discussions about the production of oil and gas. And there’s a big panic over the price, and there’s a big panic over how much oil and gas can be produced. But it’s basically a completely different conversation that we need to be having. It’s just a fascinating parallel. At the same time as the price of oil is plummeting, there’s this climate change negotiations going on in Lima. Next day, there will be what many consider really the last chance to come up with any meaningful climate deal in Paris. And so while that’s happening, we have this panic over the fact that, oh, gosh, you know, we’re not able to produce quite as much oil and gas as we hoped in the United States. But the real issue is that producing all this oil and gas is hastening climate disruption. And so I think that in some ways, hopefully, this will serve as a wakeup call. But it’s definitely not serving as any kind of wakeup call for the oil and gas companies, which have profited from this very lucrative endeavor. PERIES: Okay. It sounds like their presence at the climate summit was just show. And could you begin to sort of explain, on the PR side, they’re pretending to be concerned about the environment, but when we factor in the relationship between regulators and the oil companies in the U.S., we know that they’re not really interested or invested in the environment at all. They’re more interested in the profit margins at the moment, as we can tell from their behavior. Explain that relationship a bit. HORN: Well, I think that the most telling example of the symbiotic relationship between regulators in the United States and oil and gas companies is the Interstate Oil and Gas Compact Commission that Governor Phil Bryant spoke from Mississippi about the price of oil going up. And that is basically this convening–it was founded in 1935, and it brings together permitters and regulators from the oil- and gas-producing states with lobbyists, with oil and gas industry executives, people like Harold Hamm, the very rich CEO of Continental Resources, presidential candidate Mitt Romney’s energy adviser in 2012–very involved in the Interstate Oil and Gas Compact Commission. They get together at meetings a couple of times a year and talk throughout the year. Basically, it shows that the regulators at the state level, there’s this big push to get the federal government off the oil and gas industry’s back, and that push comes from interstate oil and gas compact commission sort of behind–largely behind the scenes. Most people haven’t heard of the IOGCC, but this–I think this organization is one of the prime examples of how regulators serve the industry and help it get as many permits is possible to drill for oil and gas. But it’s not the only example. If you look at the federal level, the IOGCC talks a big game about getting the federal government off the back of the oil and gas industry, but they know at the same time that the federal government’s been helpful to their cause. So if you look at the Bureau of Land Management–it’s an organization that’s responsible for so much permitting of the offshore oil and gas. They have something called a five-year program, in which basically every five years they hand out hundreds of thousands or millions of acres of oil and gas offshore for drilling. Well, they do the same thing onshore as well, not only for oil and gas, but largely at this point for coal as their main mission for the Bureau of Land Management. So you see these regulatory agencies doing these things, and their mission sort of trumps the mission of the Environmental Protection Agency, in which we have these regulations on the books, but, for example, for fracking there’s been really no regulation environmentally since the Energy Policy Act of 2005 was passed. Only this year is the Obama administration talking about regulating methane, which is a greenhouse gas. It’s 84 times more potent than carbon dioxide in its first 20 years in the atmosphere. And methane often leaks in oil and gas fracking operations. And so I think that it’s important to see that we talk about sort of the free market, but this has all been done with the helping hand of both state-level regulatory agencies and federal-level regulatory agencies. And that has to be part of the conversation. PERIES: Steve, one of the things that the mainstream media has been covering is this pull and talk of competitiveness between the fracking industry and the OPEC countries. But this is really a myth, because the OPEC countries actually commission a lot of these energy companies and international multinational oil companies to extract their own oil. So they have to gain from both of these ventures, fracking and oil production. So it’s really a myth that this is somehow competitive. Isn’t that so? HORN: I mean, yes and no. So, yes, big oil, the oil majors–ExxonMobil, Conoco Phillips, the major oil and gas services companies like Halliburton, Schlumberger, Baker Hughes, which, actually, Halliburton just bought a couple weeks ago–these companies stand to gain no matter what happens. They’re global multinational corporations. We saw during the push for sanctions in Russia, for example, ExxonMobil has joint ventures with Rosen asked. And they were one company that was feeling a little bit awkward about the fact that there may be sanctions in Russia because they have such close relations with President Putin in Russia Rosneft. And so, yes, in a way. But at the same time, we have to acknowledge that in the United States there’s also smaller producers, independent oil and gas companies, that will be feeling the hurt from these dropping in oil and gas prices. And that’s in these smaller fields, like the Tuscaloosa Marine Shale or fields that are not doing as well, such as the Haynesville Shale in Louisiana. Those companies do stand to lose from this rivalry. And in a way it’s kind of symbolic of the economic system at large, in which these too-big-to-fail banks, that they didn’t fall when the economic crisis hit in 2008. Well, these big oil companies are not going to be hurt in any major way by the price of oil going down. In fact, even a company like Continental Resources–Harold Hamm’s company–he’s gone out and said, well, bring it on in that way, or we can handle something like $40 per barrel of oil. So the real ones who we hurt are the smaller producers, these more mom-and-pop type shops that are operating in a lot of the shale basins. And that also means that a lot of the promises that were given to local communities and fields like the Tuscaloosa Marine Shale just can’t possibly come true, based on the fact that it’s mostly smaller producers and they’re extremely reliant on the high price of oil. So, just to answer your question, basically, the big producers, they operate around the world, but the smaller producers, they operate locally. And when things like this happen, they can be hurt pretty badly. PERIES: And finally, Steve, what’s your take on what’s going on in Lima, Peru, and the lack of attention to the climate change crisis on the part of oil operations? HORN: Well, I think it remains to be seen what happens in Lima, Peru, in terms of an at-large sort of steppingstones for what happens in Paris next year. And it’ll be interesting to see how oil is actually discussed at the meeting. But as we saw in Copenhagen in 2009, I think it’s a little bit foolhardy. In 2009, some environmental activists were actually calling the summit Hopenhagen, because it had so much hope that a climate agreement could be met. And so I think in 2015, especially with these conditions, where we have the biggest oil and gas producers that were all competing against one another for and flooding the gold market with oil and gas, it’d be foolhardy to think that at a convening that brings those countries together, that all of a sudden they’re going to do an aboutface and become champions of doing something about climate change, which, I think, coming full circle, just goes to show how important it is to have citizen activists on the ground there, but also just around the United States, and even around the world, doing something about this issue, because the big oil and gas producers, the big coal producers, their biggest concern right now basically seems to be: how can we flood the world with oil and gas to keep prices at a profitable rate? And so I think that this is something to watch for, at both Lima and also at the upcoming summit in Paris, is how grassroots activists respond to these two these conditions. PERIES: And we will certainly keep an eye on that and the progress they’re making at COP 20, and beyond into Paris. So thanks so much for joining us today, Steve.